sit yourself back for some good reading. Keep the fire stoked. Here's one I bet a bunch of you would like, Trevino L. Brings Plenty's Real Indian Junk Jewelry. Adrian Louis brought the book to my attention, and I'm so glad. Brings Plenty is the real deal. Find out more at http://www.trevinobringsplenty.com/. Trevino L. Brings Plenty is a poet and musician who lives, works, and writes in Portland, OR. He is singer/songwriter/guitarist for the musical ensemble Ballads of Larry Drake. He has read/performed his work at poetry festivals as far away as Amman, Jordan and close to his home base at Portland’s Wordstock Festival. Trevino is an American and Native American; a Lakota Indian born on the Cheyenne River Sioux Reservation, South Dakota, USA. Some of his work explores the American Indian identity in American culture and how it has through genealogical history affected indigenous peoples in the 21st century. He writes of urban Indian life; it’s his subject. 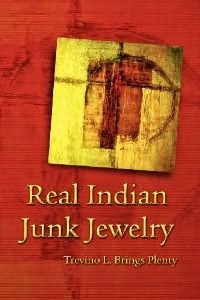 Other titles by author: Real Indian Junk Jewelry (2012); Shedding Skins: Four Sioux Poets (2008). Gamahucher Press/colin leslie dean was selected for preservation by the National Library of Australia. This title is scheduled to be re-archived regularly.